I have never been more excited about on of Zoe's new beauty range, I think it is mostly to do with the colour scheme of the whole thing. She has used some of my favourites colour combination so it would be rude not to support Zoe's new products. As an extra bonus post, as I am too excited, I thought I would share what I ordered. The first item that I was most excited about is the 'Life is Sweet Beauty Bag'. I am currently saving for Summer 2017 and I've been needing somewhere to save the cash, I thought this bag would be perfect. I adore the frill round the edge of the bag and I think it just adds a cute touch. I also love the colour, I am massive pastel lover so this pastel blue is just too cute. The quote on the front is a bonus and I hope it will motivate me to save my money. Next up is the Sweet Inspirations Body Mist. I haven't tried any of Zoe's body mists but with the new range and new scent I thought I would give it a go. First of all, the bottle itself is so pretty, I love the palm patterns that you can see through the bottle, and, like the rest of the collection the colours are gorgeous. It will fit perfectly with my dresser! I think Zoe describes the scent well in her video but to me in smells like summer. Its a lovely sweet fresh scent, It reminds me a lot of sugared almonds which I used to love! The smell lasted a long time and I could smell it throughout the day! The Bath Latte Bath and Shower Milk was something I really wanted to try, I love a good soak in the bath but I also love a quick shower so its fab that I can use this product in both situations! Its the same scent again so I loveee it!! I will say that for some reason this is my least favourite packaging, maybe because it has no pink in it? But I do love the idea of the milk bottle. It created a great amount of bubbles for my bath but it also left my skin feeling lovely and soft. Lastly, is the Sugar Dip Bath Salts, this is the only product I actually haven't tried yet. I am excited to use this as some days, I don't want to have a bath with all the bubbles and baths bombs but still feel relaxed and clean! These bath salts just make the bath smell nice which I think will be perfect for these days! I want to point out I am in love with the packaging, (the colour, the shape, the font) its very pleasing for the eye!!! 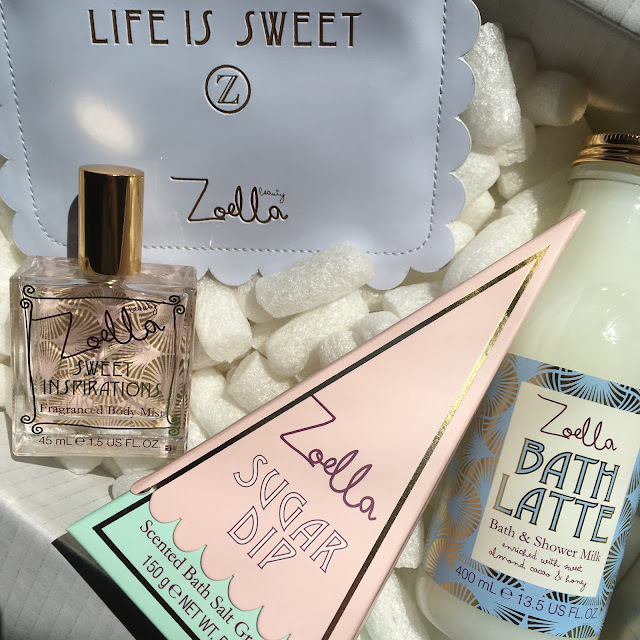 A BIG CONGRATS to Zoe and team for the launch of the Sweet Inspirations collection, I am sure it will be a success! At the same time I ordered my third 'Scrubbing Me Softly' Body Scrub as it is my favourite product! *I have realised that most of the products I linked have actually sold out, I purchased them on FeelUnique but Super Drug may still have some in stock! Let me know if you have bought anything from the range and what you think of it?